This post puller is an ideal tool for pulling all U Channel, round, square, fence and wood posts upto 8" x 8". Speed removal time by avoiding digging out pushing around each post separately. 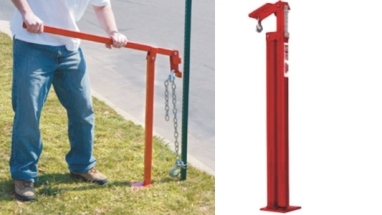 Constructed on 1-1/2" square tubing, the 39" tall post puller weighs in at only 22lbs. Chain and handle included. Delineator or fence posts can be pulled with jaw only.